The Australian Competition and Consumer Commission is threatening bike shops with a million dollar fine for selling bicycles without brakes. You know, fixies. A million bucks. The kind of fine that companies get for environmental 'slip-ups', just as one example. According to the Melbourne Age's ironically-titled article "Million-Dollar Fines to Put the Brakes on Bikes" The ACCC has already taken action against a wholesaler for distributing the ''Surly Steamroller'' without back brakes and is urging people to rat on others who do the same. Ratting on people was a proud tradition in the DDR, but let's leave that for now. The ACCC warned ''pedestrians and other bike riders are ... at risk of serious injury or death if someone riding a fixed-gear bike loses control and collides with them''. Melbourne bikers are more bemused than worried. 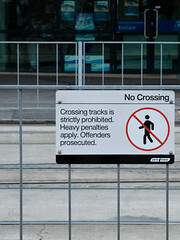 ''It's like cracking down on people who pick their nose when driving,'' said Andy White, of cycling blog fyxomatosis.com. Sasha Strickland of Pony Bike is quoted a few times in the article but her closing line is quite bizarre. I, for one, didn't know that fixie cyclists were so fragile: ''You take (fixies) away from them, they start doing graffiti, they start taking drugs ... At least they're doing something physical and healthy.'' But again, let's leave that one alone. Anyway, this is another fantastic example of branding bicycles as bad. In a country that claims to be fighting to reverse that image. The signal that this story sends does nothing for improving the image of the bicycle, whether sub-culture or mainstream. And the logic of the move is non-existent. - Car companies. Any car company that sells a souped-up car (basically any car that can exceed 30 km/h) to consumers. - Knives. Any store that sells sharp knives or even knife sharpeners that can be used to soup-up existing knives. A citizen could, when transporting the knife home, trip and fall. The knife could fall out of the bag and stab innocent bystanders. Or a citizen could cut themselves with the knife, react by jerking suddenly and bumping a pot of boiling water onto a nearby child. "Watch the step! 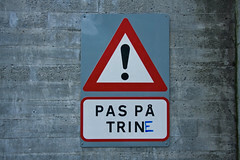 (with the added 'E' it becomes a girl's name, Trine...)"
- Stairs. Construction companies that construct stairs in any building or outdoor setting. Period. - Raw food. 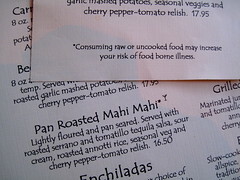 Like this menu states, "consuming raw or uncooked food may increase your risk of food borne illness". Let's go after everyone who imports and wholesales raw or uncooked food. - Pets. As previously reported on Copenhagenize.com, 87,000 Americans are hospitalised each year because of injuries caused by dogs or cats or other pets. It would be interesting to find out where this ACCC idea came from. Because it came from somewhere. I doubt that it was developed in the ACCC cafeteria one lunchtime. Did someone complain to the ACCC, causing them to act? Was it someone representing a company that could benefit directly from such actions or indirectly through the negative branding of the product? 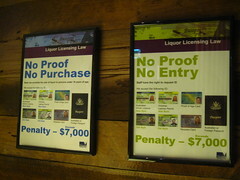 When I was in Australia last summer I was surprised, daily, at the tone of the signage. 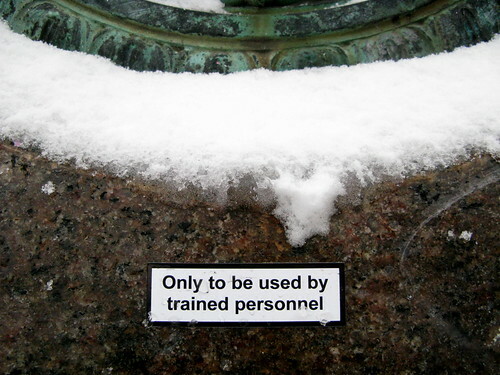 I've never seen such strict, nanny-like texts on warning signs. Sure, in the States there are warnings on everything but in most cases they are just "Coffee is extemely hot" kind of stuff. In Melbourne, the Authorities are keen to play headmaster, it seems. 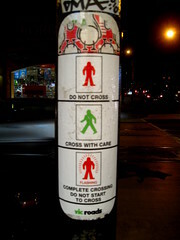 But thank god they have signs explaining in detail how to operate a pedestrian crossings. Because people are too stupid to figure that out for themselves. Classic Ignoring the Bull this. I got a kick out of all these warning signs in restaurants and bars. 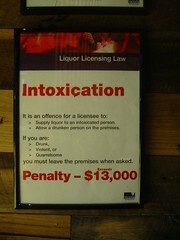 Penalty: Intoxication! $13,000! And others. Although wouldn't it just be easier to round all these penalities up to $1 million? Oh bother, as Winnie the Pooh said.